Iraq launched a massive operation in October to retake Mosul, its second largest city and the IS group's last major urban bastion in the country. 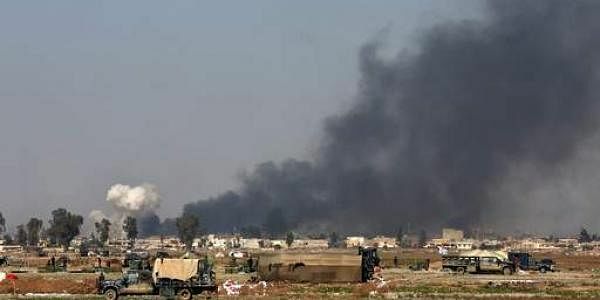 BAGHDAD: Iraqi forces battling Islamic State militants in Mosul have approached the mosque where the leader of the extremist group declared its self-styled caliphate in the summer of 2014. Black smoke billowed from the area around al-Nuri mosque, also known as the Great Mosque, as helicopters hovered overhead and fired down. At least two large mushroom clouds were seen rising from what is believed to be suicide car bomb explosions, according to live Associated Press footage. IS leader Abu Bakr al-Baghdadi delivered a Friday sermon in al-Nuri mosque in July 2014 after the extremist group seized almost a third of Iraq, declaring an Islamic caliphate in the areas under his group's control in Iraq and neighboring Syria. Iraqi and Syrian Kurdish forces have made steady advances against the extremist group since then with the help of a U.S.-led air campaign, retaking a number of towns and cities. Iraq launched a massive operation in October to retake Mosul, its second largest city and the IS group's last major urban bastion in the country. Iraqi forces declared eastern Mosul "fully liberated" in January and are now locked in a fierce battle for the city's more densely populated western half.